We think it is unfair that typically girls get to experience many more crafts than boys. Therefore, the toys and activities that we picked here are appealing to both boys and girls. We learned about Quercetti toys when we saw Fantacolor Junior in a local toy store. These toys are made in Italy and are not very well know in the US because the major toy stores don’t carry most of them. 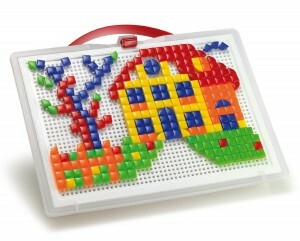 The pegboards are very popular in Europe and it is a shame that they are not a mainstream toy in the US. The Junior set was a great hit with our then 3 year old boy. He played with it for 2 years before we decided to give it to a friend. There are also a few Fantacolor sets for older children. We like Fantacolor Portable the most. If you have an older child who loves crafts and jigsaw puzzles it will surely grab their interest. Fantacolor Junior set comes with transparent pegboard, carry/display case, 16 design cards, and 48 large pegs in four basic colors (red, blue, green and yellow). Kids just slide a design card behind the pegboard and match the colors. This toy is suitable for kids over two but is best for children between 3 and 5. Fantacolor Portable is designed for kids over four but even much older children find it interesting. 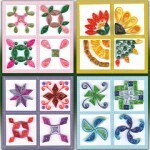 To make mosaics kids either copy the designs in the instruction booklet or use their imagination. The set has 300 square and triangular small pegs. All of the pieces store in the easy-to-carry case with lid. The handle can also be used to hang the mosaic on the wall and display the art. 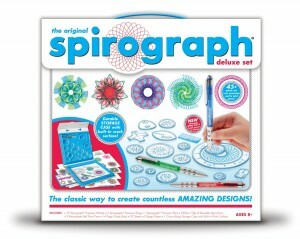 The Spirograph was first introduced in 1965 so it is certainly not a new idea. The set comes with 19 wheels, 2 rings, spiro-putty, 3 pens, 14 page guide book, design paper and carry along storage case. This set is closest to the original but with a new twist. You attach the wheels and the rings to the paper with spiro-putty which does not leave any marks. The design paper is very smooth which allows the putty to be removed easily at the end. We also used regular envelopes and thicker printing paper to make birthday cards. The paper was smooth and worked great with the putty but the envelopes did crinkle a bit when we were removing it. The 2 large rings come a bit warped from sitting in the case for a long time but in our case this did not interfere with the ability to make designs. The wheels and rings are made of flexible plastic but they seem very durable. After snapping them in and out of the case many times we have not broken a single piece. Younger than 8 kids may have issues with tracing the wheels without mistakes for 100+ times but after a bit of practice they will get the hang of it. The designs that come out are visually pleasing and perfect for creating fast and easy birthday cards, gift-tags, and more. 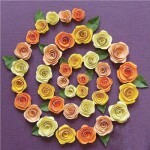 If you have not heard of the art of quilling then you should look at the amazing designs below. This is not marketed as a toy for kids but it should. If your kid loves arts and crafts they will certainly love this one too. The beauty of quilling is that it is not difficult to make outstanding art. You just need to roll a thin strip of paper, let it relax a bit, glue the end, and press a bit to form leaves, flower petals, and more. There is a lot of repetition of a few basic forms, which when arranged, create intricate designs. A friend and her 11 years old daughter have enjoyed quilling together for couple of years now. This kit includes everything you need to begin making beautiful art displays. You can try with homemade paper strips but the pre-cut ones are even and enhance the design significantly. There are many videos on YouTube that show quilling. 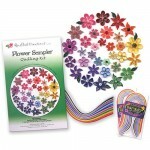 For more ambitious artists there are many quilling kits with paper strips and instructions. You can find them in craft stores or on Amazon. Even the simpler designs look beautiful. They make great cards and wall art. 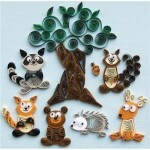 You can find inspiration by looking at “kids quilling ideas” on Google Image Search. Crayola Model Magic is not really a toy but is so great that we had to mention it here. It is often a better alternative to play dough. It is very clean to work with, does not crumble and does not stain. It is lightweight and dries within 24 hours. Once dry, kids can paint it or draw on it with markers. You can find model magic in craft stores or toy stores. The only problem is that it is either in small amounts and too pricey or in large containers and has to be used quickly. When we found the Classpack we were very excited because the model magic does not have to be opened at once. It can stay fresh in the individual pouches for a very long time. Ours lasted for 2 years. The Classpack pictured here includes 21 packages of white, and 18 packages each of blue, red, and yellow. There is also a similar Classpack with 75 white packages. 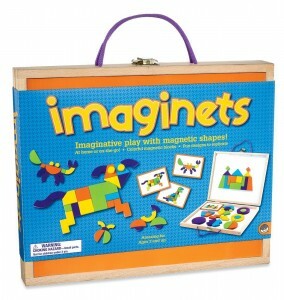 Kids love magnets and colorful shapes and Imaginets is just that. 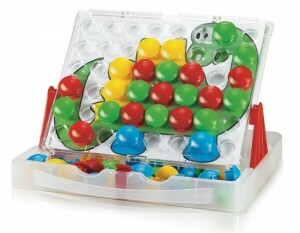 With 36 wooden magnets in varying shapes and colors children copy or create their own fun designs. 50 design cards are included. The set comes in a wooden case with rope handles which makes it a perfect travel activity. The magnetic surfaces on the inside of the case also double as dry-erase boards. 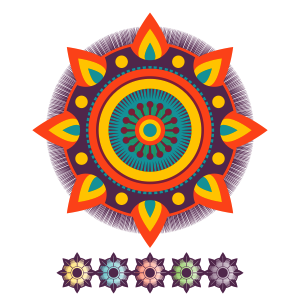 Imaginets is for any child over 3 who enjoys making designs. An Expansion Pack with 27 more magnets and 10 design cards can be added for more advanced creations. The Rainbow Loom is a great bracelet making tool. We have seen kids as young as 7 work on demo looms at Toys R Us. Our son at 9 has the dexterity to do everything but needed a parent to read the instructions and tell him what to do initially. This probably will be the case with any child who is of age interested in bracelet making. It requires patience to position band after band and loop them together using the included tool. But at the end the kids are rewarded with a colorful bracelet or ring. The rubber-band jewelry makes great gifts for friends and relatives as well. There are plenty of bands and C-clips in the kit for 24 basic bracelets. The C-clips are used to connect the ends of each bracelet. Additional bracelets and C-clips are also available. 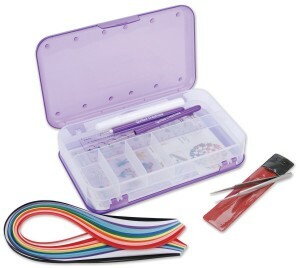 Cra-Z-Art offers similar bracelet kit by the name Cra-Z-Loom. 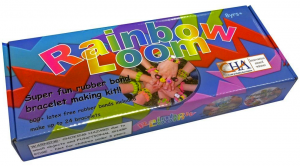 The loom is pink and comes in one piece, while Rainbow Loom is transparent and has to be assembled from a few pieces which allows for different configurations. The instruction booklet covers 3 types of bracelets instead of only the basic one in Rainbow Loom. 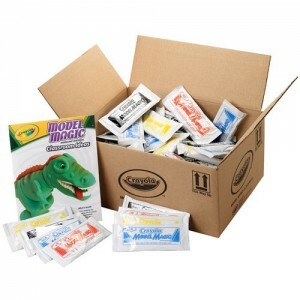 Both kits contain 600+ rubber bands in many colors. You have to turn to the web to learn additional looping techniques. 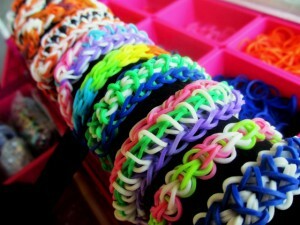 The Twistz Bandz YouTube Channel contains many video tutorials for different types of bracelets.